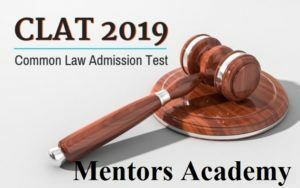 Mentors Academy is judged as the CLAT Coaching in Chandigarh, fundamentally in light of the fact that it doesn’t trade off with its quality and standard of instructing. It is difficult being the best, however, the Mentors Academy group is dependably up for a test of the most astounding size is the CLAT coaching in Chandigarh. Mentors Academy, a noteworthy division of Career Shapers, has been centering for as long as 3 years to sustain a standard quality instruction to the competitor who need to make an imprint in the scholarly and who need to be ones to go ahead with the lamp of illuminate for the future eras. CLAT 2019 is Scheduled on May 12 (Sunday 3:00 PM to 5:00 PM) in pen and paper mode. The official notification has been released at clat.ac.in. Law Students seeking admissions in 3 year / 5 year Integrated LLB and LLM Programs in 19 NLUs and other private institutions can apply online from January 13 2019 to March 31, 2019. The fee for application is INR 4000. Latest Update: CLAT Application Forms are available on the website. Candidates can submit their forms till March 31, 2019. The conducting authority of CLAT 2019 is NLU Odisha. As per CLAT Eligibility, aspirants should have passed class 12 for UG courses. For PG program, Students must have an LLB/ any other equivalent degree. Interested Students can submit their applications at www.clat.ac.in by using their Email ID and Mobile Number. The exam will be conducted offline (pen and paper mode). For LLB, the exam will consist of 200 MCQS (objective types of questions) of 200 marks. For LLM, Aspirants have to attempt 150 multiple choice questions (MCQS) in 2 hours. CLAT or Common Law Admission Test 2019 is a national level exam organized by 19 NLUs on a rotational basis. It is held for admission in law courses offered by 19 NLUs and various private universities and colleges. CLAT Coaching Classes in Chandigarh, Welcome to Mentors Campus, the campus that provides accessibility to the students looking for a challenging career ahead. Mentors Academy provide the path that leads to the most career opportunity of the current modern educational era i.e. Law. Our CLAT coaching classes in Chandigarh lets the desiring candidates exploring the passionate profession becoming a law executive. We follow special and creative methodologies to raise a candidate’s confidence level and prepare him to bear the challenges and competitive exam of Law entrance named with Common Law Admission Test (CLAT). Our coaching classes for CLAT in Chandigarh take you to explore the world of UG or PG courses provided by National Law Universities. WHAT IS EXACTLY CLAT ? CLAT is defined as the entrance doorway that takes you to traverse the world of undergraduate and post-graduate programs of law provided by National Law Universities. Following the challenging surrounding the education held, CLAT is the National level common entrance examination which is conducted by the NLU to search the most eligible candidate to handle the legal system effectively and efficiently. Students can comfortably get admission in the UG or PG courses, depending upon the merit list and eligibility criteria. The CLAT coaching institute in Chandigarh supports the candidates through the latest study material and outstanding teaching techniques done through expert and experienced staff. Candidates belonging to unreserved/OBC/Specially disabled Persons/NRI/NRI Sponsored Categories – A pass in 10+2 or an equivalent exam with a minimum 45% of marks required. Students belonging to SC or ST categories – A pass in 10+2 or an equivalent exam with a minimum of 40% of marks required. Students appearing in the 10+2 examination in March/April, 2019 can also apply for the CLAT 2019 exam. Note: The candidate will be required to bring proof of the minimum qualifying marks at the time of admission, failing which he will be denied the admission. CLAT offers admissions to both national and NRI students in the one Year LLM Course offered at different NLUs and other institutes or universities accepting CLAT Scores. There is no maximum age limit specified for appearing in the CLAT examination. Thus, aspirants of all ages are eligible to appear for the law entrance examination. Computerized draw of lots will be taken into power. CLAT 2019 entrance exam is divided into five sections. The purpose of first section is to check an individual’s ability to logically solve a situation. The second section tests an individual’s interest & knowledge about Law. Other sections are focused to evaluate candidate’s passage comprehension ability, mathematics and Basic English knowledge. It includes comprehensions, passages and grammar. The vocabulary, word meanings used therein, passage understanding, fill in the blanks in sentences and correction of incorrect sentences. It includes general awareness such as static general knowledge, questions about National and international current affairs. It includes questions checking the knowledge of the candidate of elementary mathematics. It will check the interest of individual towards the study of law, problem-solving ability, legal propositions and research aptitude. It includes syllogisms, identifies patterns, logical sequences, rectifies illogical arguments, logical links and analogies. Mentors Academy is an exclusive and dedicated coaching Institute in Chandigarh which provides coaching for Law Entrance Exams only. Therefore, Mentors Academy is specialized in Law field. Mentors Academy has got specialized and Expert staff. Every teacher has specialization in his or her field of teaching. Mentors Academy is located in the centre of tri-city, which is in sector 34A, Chandigarh, therefore it is approachable from all the directions. Mentors Academy has produced very good result in last CLAT exams. Mentors Academy conducts both yearly batches as well as crash courses for CLAT Exam. Mentors Academy conducts coaching in small batches so as to provide proper attention to each and every individual. Students get an ambience at Mentors Academy which is very conducive for their studies, healthy completion and growth. Mentors Academy conducts mock tests so as to give first-hand experience to the Students appearing for the exam. Mentors Academy keeps the interests of the aspirants first and foremost.